Lemon Thyme Chicken. Sabrina Baksh/Regarding BBQ, Inc. This is a quick and easy way to prepare tender and delicious chicken breasts. Grill them hot and fast and enjoy ​with your favorite side dish. For best results, try flattening the chicken to nearly half its thickness by covering with plastic wrap and using a kitchen mallet or rolling pin. This allows the marinade to penetrate more efficiently. Combine oil, lemon juice, thyme, salt, black pepper and garlic in a small bowl. Place chicken into a resealable plastic bag and cover with mixture. Seal bag and allow the chicken to marinate in the refrigerator for 1-4 hours. Place chicken on the grill and cook for 12-14 minutes, turning halfway through cooking time. Chicken breasts must reach a safe temperature of 165 degrees in the thickest part before they are considered fully cooked. Once they reach this temperature, remove from heat, place onto a plate and let meat rest for a few minutes before serving. Slice and serve in wraps and over salads. 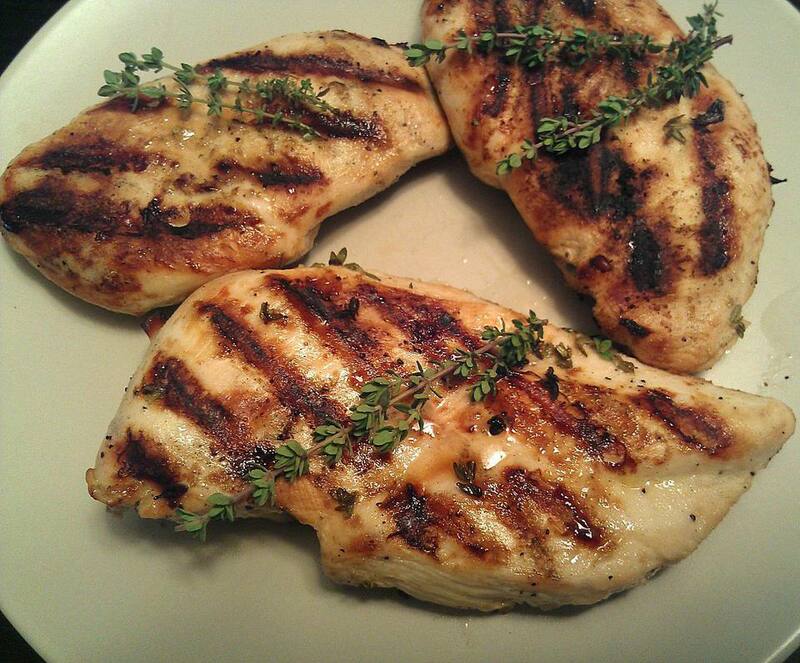 These grilled chicken breasts are perfect for clean eating, high protein, and low carb diets.